Dr. Ernie Ward reminds us all why cats sometimes misbehave due to environmental changes. Visit Dr. Ernie at www.DrErnieWard.com or on Facebook. This appointment was going to take a while. Mrs. Smith (not her real name) calmly stroked her purring feline as she continued raising her voice toward me. Frieda was having, as Mrs. Smith put it, “bathroom problems.” Veterinarians refer to urinating outside the litter box as “elimination disorders” or “inappropriate elimination.” It was going to be challenging to find anything Mrs. Smith would agree with me about during this visit. “I haven’t changed her food, her litter, or her bowls. Frieda’s routine has remained the same. I haven’t traveled recently, had houseguests, or entertained friends for the past month because of the smell and stains. Either fix Frieda’s problem or I’ll find someone who can.” She smiled a smile that said she meant it. Elimination disorders typically fall into two broad categories: physiological and psychological causes. Physiological disorders include conditions such as bladder infections, kidney disease, pain, hormonal disease, or bladder stones. Psychological or behavioral problems can be much more complicated. Cats can suddenly develop an aversion to the texture, smell, or even color of their litter. They may begin to dislike the location of the box or become frightened and avoid the room altogether. It can take a considerable amount of sleuthing to reveal the root of many behavioral causes of inappropriate elimination. Because Frieda’s diagnostic tests had come back normal, I needed to pull out my best Sherlock Holmes if I was going to solve this case. A thought struck me. “How often do you entertain friends?” I asked. Maybe I was on to something. “Does Frieda still nap on the couch?” I asked. We discussed moving the couch, using a facial pheromone product, relocating the litter box, and adding another box. She agreed to move the couch and to pheromone treatment. 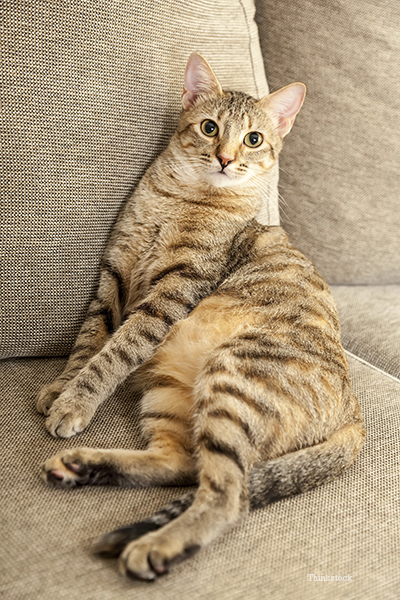 Elimination disorders in cats can be a diagnostic challenge. Once medical conditions have been ruled out, it’s important to thoroughly evaluate your cat’s lifestyle. Most cases will improve by adding a larger, uncovered litter box in a quiet, less-trafficked area and using facial pheromones. Other times you have to move a couch.